This week’s Top Ten Tuesday is a FREEBIE and I’ve decided to go with books made into movies. I don’t typically watch books adapted into movies, however there are a few that catch my attention. Here are a few Pages-to-Screen that have caught my eye. Some movies I’ve seen prior to having read the book, which in my world is a no no. And without further adieu, let’s get to it. 1. The Millennium Trilogy by Steig Larsson is perhaps one of my favorite book series I’ve ever read. And it is one of my favorite movie trilogies. I binged the Swedish version a few years ago and was pleasantly surprised as to how close they stayed to the books. 2. 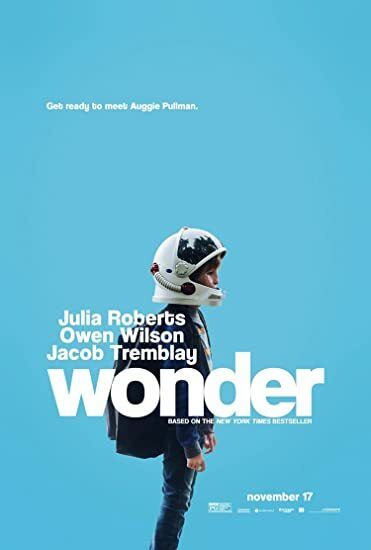 I read Wonder by R. J. Palicio a few years ago and loved it. I was thrilled to hear that a movie was in the making and couldn’t wait for it to come out. I didn’t love the movie, but I did like it. For me there was something missing. I think I’m in the minority. 3. I read The Princess Bride by William Goldman after seeing the movie . I was completely unaware of this book’s existence; which shocked my sister because she read and owned it as a child and was under the impression I read all of her books growing up. 4. Ready Player One by Ernest Cline is still on my TBR. I plan to read it by month’s end and maybe go see the movie, but looking at the trailer it doesn’t make me want to go spend $13 and it doesn’t include the nachos I must have when I go the movies. 5. A Christmas Carol by Charles Dickens is definitely one of my favorite Christmas tales. And the original movie with Alastir Sim is by far my favorite adaptation. I, probably like most of you, grew up watching the movies before ever reading the story. Had your favorite book been adapted to a movie? If so, what book? And which did you like better, the book or the movie? I think I watched the first in the Millenium Trilogy but really didn’t care for it so never watched any more…. I completely understand. Did you watch the Scandinavian version or the American version? I haven’t seen the American version. The last movie in the original Scandinavian was really hard to watch. It took me a couple of days to get through it. They hard to watch. The books are disturbing and the movies are just as disturbing. Seeing it brought to life is overwhelming for folks. One of my coworkers said she couldn’t watch the movies because she found the books to be a bit to intense for her.